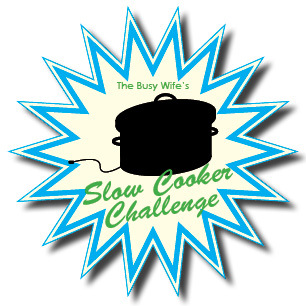 If you’ve missed my previous posts and would like to join in the Slow Cooker Challenge, go here to read more. This week, I made Slow-Cooked Pork Teriyaki. I found the recipe in a pdf called “New Year, New You: The 30-Day Challenge” from MyDailyMoment.com. Honestly, I don’t remember downloading this pdf…and I don’t remember ever being on their website…so I’m thinking I must have gotten it from Pinterest. The pdf includes 30 recipes plus a “tip of the day” beside each recipe; some of the recipes sound pretty good, but this is the first one I’ve tried. Most of the tips are good ones – conquering myths about diet and exercise. Back to the recipe: The name of the recipe is really what grabbed my attention – thinking if I could recreate a hibachi favorite with my slow cooker, we’d never have to go again. But the ingredients left me a little skeptical (apple juice?). Overall, it turned out pretty well – of course not as good as the hibachi restaurant’s though (don’t worry, Benihana’s, we’ll be back). I also paired the meal with white rice, steamed dumplings (found in the frozen food section), and some vegetable egg rolls from the grocery store’s “market” section. One thing I’ve discovered about grocery store egg rolls – frozen or refrigerated, as we’ve tried a couple of brands – they’re never as good as a restaurant’s. And while I think there was something missing from the pork, the egg rolls are really what left me unsatisfied with the meal. Just thinking about the pork, if I were giving it a rating, I’d give it 6 out of 10 stars. I guess it’s about what you’d expect out a “healthified” version of something you love. Combine all ingredients except pork, cornstarch, and water in a slow cooker. Add pork, turning to coat. Cover and cook for 7 to 8 hours on low (or until thermometer inserted in roast reads 160 degrees). In a saucepan, combine cornstarch and cold water until smooth (to me, this mixes better if done in a cup then added to the saucepan). Stir in cooking juices; bring to a boil, cook and stir for 2 minutes or until thickened. Serve with the pork roast. More thoughts from me: I shredded the pork, mixed it in the sauce, and served on top of white rice; I think I would chop it instead…maybe try searing the roast first too. Repurposing: 3 pounds of pork is a lot for two people. The recipe says 8 servings. After eating it twice, I was ready to do something else with the meat that I didn’t cover in the sauce. So, here’s some ideas: Barbeque sandwiches (with coleslaw! ); pork tacos (with all those corn tortillas have left over from last week) or similar (enchiladas, burritos, nachos, etc); homemade pork gyoza (steamed dumplings) or egg rolls; baked beans; some sort of shepard’s pie or hearty soup; some sort of breakfast casserole (I’m imagining hash brown, eggs, cheese, pork, peppers, onions). I have yet to decide how to use our leftovers…maybe egg rolls to keep in the freezer so I don’t have to suffer more bad store bought ones; am I really up for that challenge?? ?